Established Evil Geniuses, look away. This is for the novice Evil Genius. The Evil Kinda-Smart-Guy, if you will. 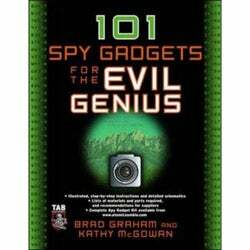 101 Spy Gadgets for the Evil Genius isn't 101 spy gadgets neatly boxed for your use, it's a book that teaches you how to make your own gadgets to spy on your neighbors. Most projects in the book can be done with a little bit of time and only $30, which is great, since your current schemes have probably been far from lucrative. But after knowing how to build your own nanny cam, figuring out how to see and photograph in the dark, wire yourself for undetected recording, and even alter photographic evidence, you're well on your way to attracting the attention of Batman and/or Jack Bauer. Wait, are they the same person?